One small bit of bad luck was with the subject of this posting: organs. I happened to grow up in an area where “great” organs weren’t “within reach”. In fact, up to and including high school I didn’t have the notion of organs as possibly being something “special”. They were instruments installed and played in churches, their sound was OK, and that’s about it, as far as I can remember. This changed slowly once my record collection started featuring organ recordings. Still, collecting organ music took a rather slow and non-systematic start. At least, the beginning was OK — at least, it felt that way at the time, around 1970: a box with all of Handel’s organ concertos, played by the Collegium aureum and Rudolf Ewerhart (*1928) on magnificent organs such as the famous Gabler organ in Weingarten, or the Riepp organs in Ottobeuren. Parts of this recording (op.4) are still available as MP3 downloads. I recently listened into previews. Yes, the organs are magnificent, indeed; it took me 10 – 12 more years later to visit those places once! However, I still was disappointed. The sound quality, the playing of the orchestra, as well as the organist’s playing / articulation can’t compete with newer interpretations. The Collegium aureum was among the pioneers in the early days of historically informed playing, but has since been superseded. I actually find it hard to listen through these interpretations now. Recordings with orchestra in Weingarten or Ottobeuren are acoustically anything but trivial, I should say. That aside, the organs in Ottobeuren and Weingarten are overkill here: the are vastly oversized compared to anything Handel had at his disposal at his time. 1974: Bach organ works played by Karl Richter (1926 – 1981). 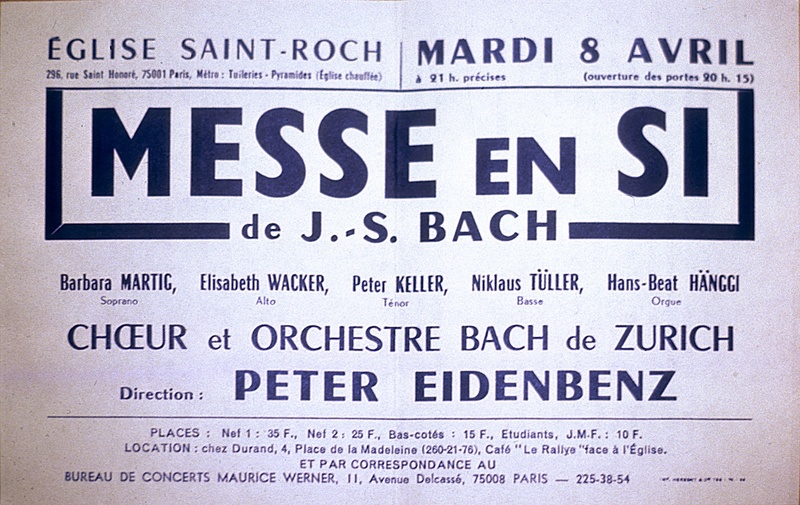 In April, 1975, I joined the Zürcher Bach-Chor on a concert trip to Paris and Autun where we would perform Bach’s Mass in B minor.We were traveling by bus, and a small portative organ by Mathis Orgelbau traveled along with us in a little trailer. I don’t remember the details, but I must have been helping with unloading / moving / setting up the organ. And in doing so I got into contact with the organist, the late Hans-Beat Hänggi (1945 – 2002). He was a very friendly and open person, and I was very interested in knowing about a mechanical organ’s internal functioning (as a child already, I always wanted to know how things worked internally) — so I ended up questioning Hans-Beat Hänggi about all possible details about the construction of mechanical organs — for hours and hours on that trip (I wonder whether he was ever bored by my questioning! ): it was a fascinating subject to talk about! Anecdote #2: The Zürcher Bach-Chor is not a professional choir, obviously (how otherwise would I have been able to join? ), and for us choir members, singing in Paris was quite an experience. The church (Église de Saint-Roch) in which we were performing perhaps wasn’t the best one, acoustically. Strangely, there was a giant curtain between the rear part of the nave and the choir. We were singing in the choir. The audience was rather small (not really an economic success, this trip!). Still, we were all rather excited, probably nervous. All went really well, as far as I can tell, up to the “Agnus Dei”, only the “Dona nobis pacem” to go. At that point one could almost feel the big feeling of relief that went though the choir. That was premature, unfortunately! The “Dona” starts with the male choir voices and a colla parte orchestra accompaniment, on a new chord. The attention must have gone down, and someone in the bass section (no, not myself!) must have been humming the bass tone at low volume? We all started singing that fugato part, forte — and everybody had an immediate shock, because something was seriously wrong! The rear half of the choir (the male voices, essentially, or at least the entire bass section) was singing a full tone too high!! We saw that conductor and orchestra were disconcerted, but it took us about a second to realize that something was wrong, and how. The conductor started waiving his arms to increase the volume, the orchestra followed. Hans-Beat Hänggi pulled all the organ stops at once and started playing full chords. This had very limited effect, though, given the small size of the instrument and its broken mixture stop. After some 5 seconds things were on the right track again. Peter Eidenbenz, the conductor, was of course caught by total surprise, otherwise he might have stopped and re-started? From Paris, the trip then continued to the Burgundy area. There, we visited the famous church of Vézelay and gave another concert at the cathedral in Autun. My participation in the Zürcher Bach-Chor (1973 – 1984) also brought me a brief encounter with another organist from the Zurich area. Bruno Reich (*1947) is one of many disciples of the late Erich Vollenwyder. He had actively built up a large fan community over the years. He was giving organ recitals about every 2 months, and he also sold his recordings to that community. The church in his recitals was always full, the earnings go to charitable organizations. Bruno Reich briefly joined the Bach Choir just for Giuseppe Verdi’s Requiem. I have not maintained the contact with Bruno Reich, but I have since acquired several of his recordings (mostly vinyl) with works by Franck, Liszt, Reger, and Schumann. In my vinyl days, I then collected a fairly wide (but thin) spread of organ works, mostly non-systematically, almost accidental, with the (more & less) obvious range of organists of those years (& older), such as Marie-Claire Alain (1926 – 2013), Karl Richter (1926 – 1981), Daniel Chorzempa (*1944), Felix Patchlatko (*1950), Lionel Rogg (*1936), and others. One obvious focal point was in organ works by Johann Sebastian Bach. After some “random hits” I started collecting the Bach organ works played by Hans Vollenweider (1918 – 1993) on the organ of the Zurich Grossmünster. It would only be years later when I finally heard that instrument live. But I did learn that this instrument played a key role in the revival of organ building in the baroque tradition. OK, it’s a far cry from a historic Silbermann organ — but with that instrument, organ builders re-started building organs with mechanical traction, and (neo-)baroque intonation. In the 70s, I found Hans Vollenweider’s interpretation of Bach’s organ works on that instrument the most natural, appealing one (among the modest collection that I had at that time), so I embarked on acquiring the complete Bach collection with that artist. That project cancelled itself with the end of the LP period, and because I moved to Germany, away from my LP resources. Parallel to the LPs with Hans Vollenweider, I also acquired three LP boxes with Michel Chapuis (1930 – 2017). These appeared under the label “Das Alte Werk” by Telefunken and included the scores. The scores are a nice feature, but Chapuis’ interpretations didn’t really convince me, even though he was playing on historic instruments. With the end of the vinyl era, my collecting organ works came to a grinding halt. It only resumed some 12 – 15 years later.